Given that Sebastian Vettel took his Red Bull to the top of the timing sheets in the final two practice sessions of the German Grand Prix, it was expected that the three-time world champion would challenge for pole position. And challenge for pole he did, only it wasn't quite enough. Sebastian Vettel had to settle for second on the grid, with team-mate Mark Webber third. 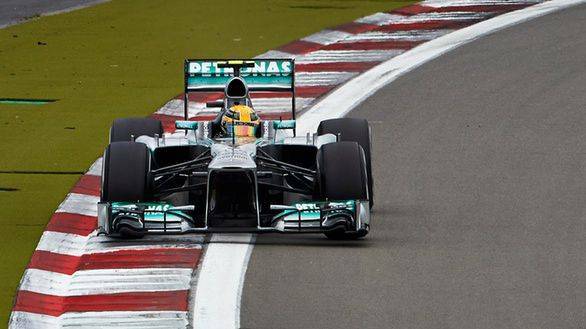 Pole position at the German Grand Prix, however, went to Lewis Hamilton. In the final seconds of the qualifying session Hamilton managed to set a timing of 1min 29.398secs, beating Seb Vettel by 0.103secs. This was in stark contrast to the tyre woes that Hamilton moaned about in the final Free Practice session at the Nurburgring. Indeed, the British driver even described his car as 'undriveable' after oversteer woes plagued his Mercedes. While it seemed like everything went right for Hamilton, the qualifying session went completely wrong for his team-mate Nico Rosberg. Having won the British Grand Prix last weekend, Rosberg showed early pace at Germany, topping the first practice session on Friday. But things came undone for him during Q2. When Rosberg took second on the timing sheets temporarily, and headed back to the garage, the rest of the pack stayed out on track. The Mercedes team was hoping that the German had done enough to ensure he didn't get knocked out, but as it turned out, he did. And while Rosberg sat in the cockpit watching as the timing screens flashed he'd be starting the race from P11, his team-mate had made it into Q3. And as we know, it wasn't just Q3 for Hamilton - he even took pole. So there you have it, one Mercedes on P1, the other on P11. Lewis Hamilton is left the task of challenging Sebastian Vettel and preventing him from scoring a maiden win in Germany. The Mercedes might have the pace, but keeping the two Red Bulls behind him won't be an easy task.